The latest data in Axco's Global Statistics shows that China has experienced continued growth in the Life and Benefits market since 2012 (PA & Healthcare included). Preliminary figures from 2016 indicate a 36.5% growth from the previous year. 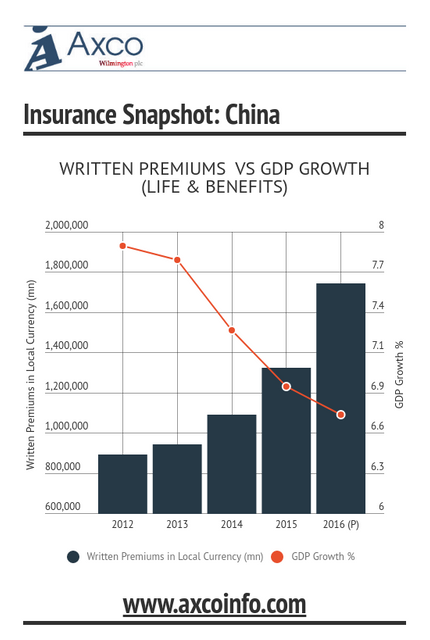 Many analysts suggest that China's total insurance market is due to grow at a speed double that of the general economy in the next five years due to structural reformation and a changing perception of the value of insurance. The information gathered in Axco's detailed International Market Reports, as well as Global Statistics, support this assertion. Axco will continue to monitor and report on China's market as there are rumours of future stumbling blocks, including a slowdown in the economy, a reduction in investment returns and greater official scrutiny of overseas investment plans. The infographic below showcases China's L&B (with PA & Healthcare) growth since 2012.